Even if you think Federation Square is an ugly mess, maybe an Apple store just doesn’t belong there. If that’s the case, then you might even want to come to a protest rally ! An Apple megastore does not belong in Fed Square and we need to take to Our City, Our Square to make our voices heard. Join a free rally at Fed Square on Wednesday 19 September 2018 from 5:30pm. At 6.00pm SHARP we will have our photo taken with the Yarra Building, hopefully not for the last time. 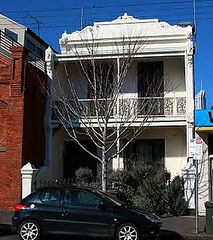 This is the building that will be demolished to make way for the Apple megastore. Bring family, friends, and work mates. We look forward to seeing you there. Spread the word and show how much you care for public space – before it’s too late for Fed Square. Confirmed speakers include: Simon Ambrose (CEO, Victorian National Trust), Colleen Peterson (CEO, Ratio Planning Consultants) and Councillor Rohan Leppert (Arts, Culture and Heritage Portfolio Chair, City of Melbourne). 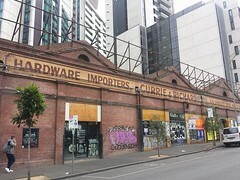 ← More facadism in Bourke Street – you can help.